Oscar Pistorius sits in the dock in court in Pretoria, South Africa, Friday, March 14, 2014 on the tenth day of proceedings. Pistorius is charged with the shooting death of his girlfriend Reeva Steenkamp, on Valentines Day in 2013. Prosecutors at the Oscar Pistorius murder trial are showing photographs from the bloody scene where the athlete fatally shot his girlfriend. 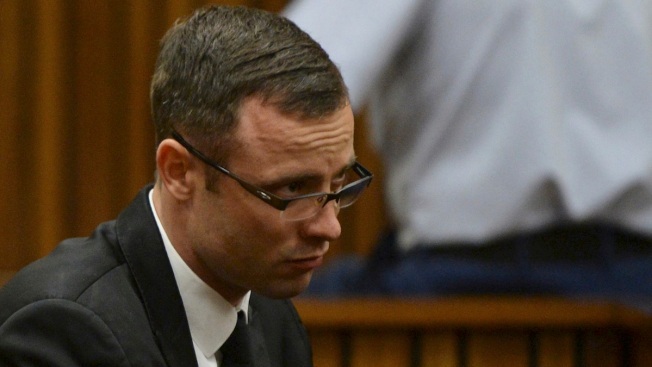 Chief prosecutor Gerrie Nel on Friday asked a former policeman who investigated Reeva Steenkamp's death about police photographs of the blood-spattered bathroom at Pistorius' home, as well as wounds that Steenkamp suffered. Images of blood stains on the walls, floors and furniture in Pistorius' home were displayed in court Thursday, prompting Pistorius to look away from TV monitors showing the photographs. The screen in front of Pistorius was switched off. Pistorius, the first double amputee to run at the Olympics, is charged with premeditated murder for Steenkamp's killing on Feb. 14, 2013. He pleaded not guilty and says he shot her by mistake, thinking she was an intruder.